THE SILVER ROSE! FROM DWARFCRAFT DEVICES! Never has drama sounded so good. Classic rock – YES. 90’s garage rock – YES. Turn up the Super Fuzz side with a medium gain setting, dial in the bias for maximum sustain and let the power chords ring out. Turn up the gain and twist the bias to squeeze that signal down to a compressed electronic wave for single string leads and score a spy movie. Flip the mids switch down and enter the realm of the Wizard of Doom. Something a little warmer, maybe? 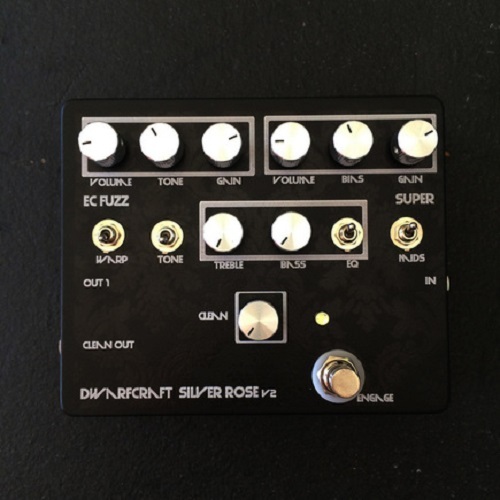 How about the EC fuzz? A streamlined Eau Claire Thunder can be dialed back to overdrive range or cranked up to a raging wall of thunder. Wind it into an aggressive sustained lead machine. Blast the Tone control for the huge, blown out, “Am I going to break something?” juggernaut you’ve come to expect from the Thunder. Wait, something a little off? Need more bottom? More top? Flip on that EQ. Boost the bass and treble up to 10db. Watch your levels, friends, you could blow speakers if you act a fool. “But, old pals, I’m a strange person, and I want a clean signal mixed with my fuzz!” Hey that’s cool, we’re all strange in one way or another. We have a big silver knob for that! This clean knob will boost your clean up to an 11x voltage amplification! BIG ENOUGH FOR YOU? “Oh, also old pals, I like to experiment in the studio with multiple signal paths, and sometimes I use two amps with separate effects lines live.” That’s why we put in that auxiliary clean output jack. There’s always clean signal coming out! Handy for just those situations you mentioned. “Wait, does it work on bass?” We put so many flavors of bass weaponization in here that you might lose a day or two tweaking knobs and feeling your pants flap as you create sound after sound. Please note: Due to the nature of these two circuits, this pedal is not silent when engaged. Some people don’t mind, some people will just turn the pedal off when not in use, some people will hate it. We also cannot make the overall pedal quieter. Dimensions: MAP Enclosure size = 5 5/8" x 4 5/8" x 1 9/16"
Related items: Peppermint Fuzz Pharaoh M.O.T.H.